In the last few years I have been developing an area of practice in Sensory Dramaturgy, exploring multimodal and interdisciplinary approaches to theatre making processes when creating performances that work dramaturgically on multiple sensory levels. This raises interesting ideas and ways to interact with an audience and what we mean by immersive theatre. The research has also led me to explore accessibility by experimenting with how to integrate audio description and British sign language into performances. Helen Hall Arts, Produced Bounce Festival September 2017. Inside the Speaker will take you on a journey of the senses. It invites you to step inside the speaker to experience music and dance differently and it welcomes you to the world of the speaker, partially sighted dancer and choreographer Helen Hall. An intimate, beautiful and provocative solo performance which will challenge they way you experience the world. "I became immersed into Helen’s world, a moving experience, mind and body, particularly enjoyed the sensing world and dramatic use of lighting, the performing close to the chairs in front and behind I loved." "Amazing performance engaging all the senses, and intimacy involving the audience with the dance. Engages audience to think about themselves. Very much enjoyed the performance." THE UNHEARD is an immersive, autobiographical theatre piece exploring living with the hidden disability of degenerative hearing loss, tinnitus - and childhood trauma - through a combination of live physical storytelling, recorded scripted scenes of the play, a carefully composed soundscape and audience interaction in and around issues of hearing and hearing loss. 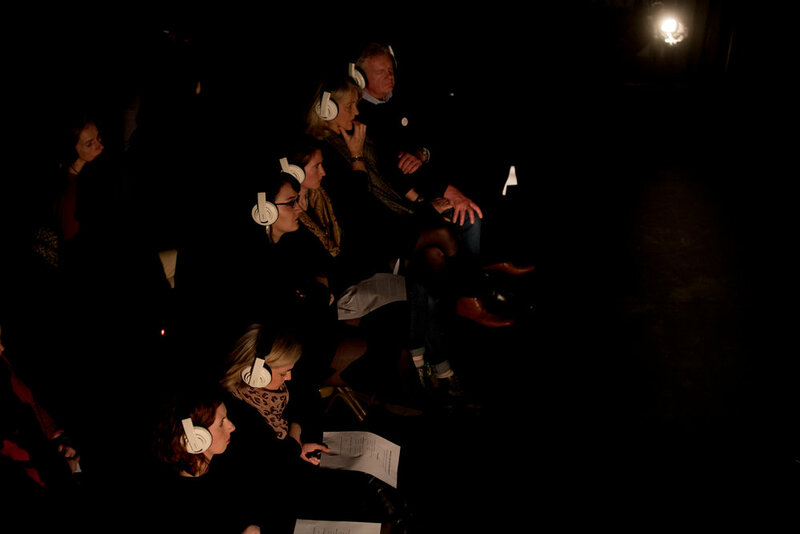 The audience are brought right into the experience by wearing headphones throughout and experiencing sound and conversations as a person with hearing loss would. “The use of headphones was very effective. Feel like I have learned more from this immersive theatre than I have from verbal and written communication alone. I thought about the people in my life that have sensory impairment”.